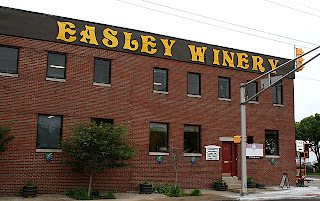 I stopped by Easley Winery, 205 N. College St., Indianapolis, the other day to give an out-of-town visitor a view of Indy's downtown winery and to pick up a few bottles of Monument and Riesling wine. While there, owner Meredith Easley had a bottle of the recently released Merlot for me and asked for my thoughts on their latest red. Please note that I am not a sommelier, but an everyday, average wine drinker. Easley is aware of that fact as you, if you read my column or blog regularly, know also. With that said, I am always ready and willing to try out a new wine. Although I have been a wine drinker for many years, and written this column (and now blog also) for going on five years, it is my first official wine review. The Governor's Merlot 2010 is 13 percent alcohol by volume and label-described as "wonderful, mellow, dry, red wine. It was aged in oak barrels that were grown in Hoosier National Forest. It is an excellent wine paired with beef, pork and pasta dishes." The wine was named after the 5th Governor of Indiana, Noah Noble. The land where Easley Winery sits today was once owned by Governor Noble. Nice homage. The wine was indeed oak-balanced. Although the label states it is a mellow wine, I would describe it as slightly heavy, rich with earth tones and that marvelous oak backdrop. This is not a wine to sip on the back deck while intermittently playing Frisbee with friends. This is a wine with a serious nature and one which expects your full attention. With its earthy layers, it has a certain agenda in mind and if you ignore that and treat it lightly, you will lose the entire purpose of this drink. Open the bottle and let it breathe while you slip on the appropriate music and fix the correct meal for this not-so-simple vine offering. My suggestion for the meal: A thick steak, cooked to your liking (which I hope does not go past medium well) accompanied with mushrooms in some fashion. A cheese with this combination might be the Greek sheep's milk cheese, Kefalotiri which complements the Merlot, beef and the mushrooms. If you are not a fan of mushrooms, my choice would be an older Manchego (Viejo), a sheep's milk cheese from Spain. The aged variety has a peppery flavor which would pair well with Easley's Merlot. Both cheeses can be found in a gourmet-style food shop such as Whole Foods Market. A central part of my enjoyment with wines is food pairing. However, I don't stop there. I believe that wine is one piece of several which make up the experience. Drinking wine while overlooking a lake is a different experience than that same wine being enjoyed while snuggling in front of a fireplace. With that in mind, music can detract or enhance the mood and experience as well. For example, Governor's Merlot is not a Beach Boys kind-of wine and would lose the attention deserved to its deep layers if you were singing along with Good Vibrations. Wine + food + environment + music = great experience. You get the idea. My choice of music: For this wine, with that meal, I would have to go with music which draws you into it. If you are a Classic Rock listener, go for Turn the Page by Bob Seger or Knights in White Satin by The Moody Blues. If opera is your taste, perhaps try Philip Quast's Javert in Les Miserables. Whichever genre is your favorite, stick with something not too light. Special note: John Lodge, the Moody Blues' bassist and vocalist, just uncorked his own wine label Krisemma. Bottom Line: Easley Winery's Governor's Merlot 2010 is layered with earthy flavors, balanced with oak and served best with a steak or thick burger. Enjoying a fine cigar with this wine would not be out of line. For more information on hours, costs, tastings, Groovin' in the Garden, Taste of Indy, and Indy Wine Trail, visit EasleyWinery.com. Elizabeth J. Musgrave is a syndicated columnist, travel writer, performing arts and restaurant critic. Catch her as Indy’s Arts & Entertainment Adviser on 93 WIBC, and follow her on AroundIndy.com, Twitter @ejmusgrave1 and Facebook. Gotta Go is published in the following newspapers: South Sider Voice, Indiana Weekender, New Palestine Reporter, Pendleton Times Reporter and Fortville-McCordsville Reporter. Love the recommendation of Philip Quast's Javert and the inspired cheese selections! As soon as I'm back in Indy, I'm going to Easley! I recommend it highly. Especially if you take time to browse their wine-related items. In the back room they have wine- AND beer-making items and classes. Glad you like the idea of pairing the wine with food, (including cheese) and music. It's a total experience for me. I will be only too happy to go to Easley with you!